Autumn has arrived. Temperatures are beginning to drop, leaves are changing and it’s time to dust off those sweaters. It’s a wonderful time of year for many, but there are others who suffer from seasonal allergies. If you’re one who deals with these allergies, you know the struggle of enjoying the season. Let Odor Removal Marietta GA show you how to battle your allergies! Finding ways to fight allergies is how your survive the fall weather. Fall is only a few months, but those months can be long if not prepared. 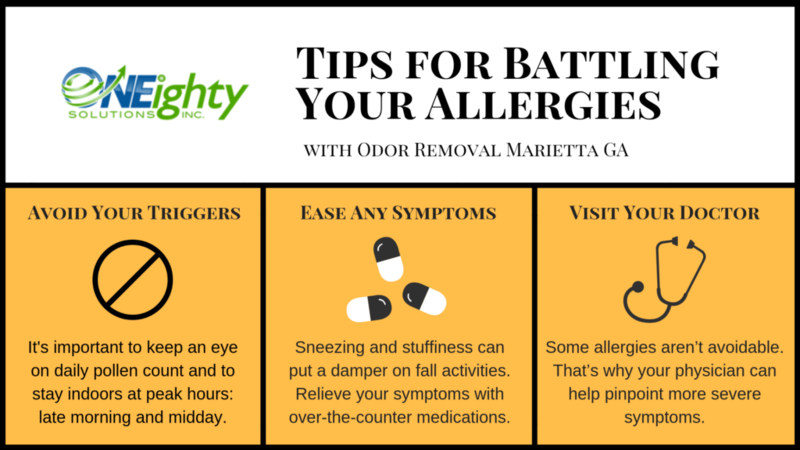 That’s why Odor Removal Marietta GA wants you to consider these tips for battling fall allergies. Avoid Your Triggers – There are days throughout the season that will be worse than others. That’s why it’s important to keep an eye on daily pollen count and to stay indoors at peak hours: late morning and midday. Ease Any Symptoms – Sneezing and stuffiness can put a damper on fall activities. That’s why you need to relieve your symptoms with over-the-counter medications. There are multiple options available for varying allergies. Visit Your Doctor – Some allergies aren’t avoidable. That’s why seeing your physician can help pinpoint more severe symptoms. Poor Indoor Air Quality can be traced to both indoor and outdoor sources. That’s even more likely during peak allergy-ridden days. If home remedies are not cutting it, we recommend contacting Odor Removal Marietta GA. We offer odor removal services like BioSweep that can help reduce allergens in your home as well as any unwanted or harmful odors. Kick your fall allergies to the curb with Odor Removal Marietta GA! We’re here as the experts to assist with your odor removal needs. For a free evaluation, contact ONEighty Solutions at 678-506-2412 or info@oneightysolutions.com. For more on how ONEighty can be the solution to your situation, like us on Facebook and see what our customers have to say on Yelp.